preheat the oven to 350. mix together flour, baking powder, zest and salt in a bowl. in a separate bowl, stir together milk, vanilla, and juice, mix. cream together the butter and sugar with an electric mixer, and add the eggs. slowly add in the dry mixture and then the milk mixture. fill your liners about 3/4 of the way full and bake for 20-25 minutes, until toothpick inserted in center comes clean. let cool before frosting. beat butter until light and fluffy. slowly add the confectioners' sugar, vanilla & clementine peel. add juice...this is the only slightly tricky part: add the juice little by little until you reach the consistencey you like for your frosting. just add it little by little while it is mixing. 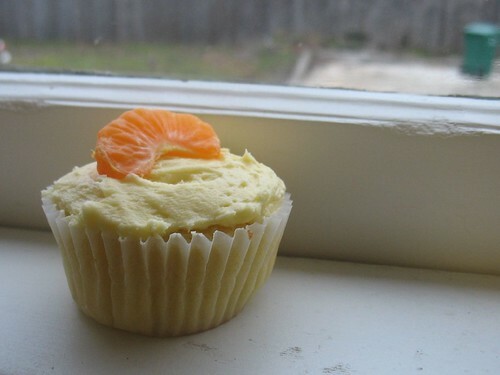 for a stiffer frosting, you can just add the juice of 2 clementines, but i was going for a more fluffy smooth frosting with a lot of flavor, so i added juice from about 3 1/2 clementines and it was just about right. they were seriously yummy! some of the best cupcakes i have ever made i think! 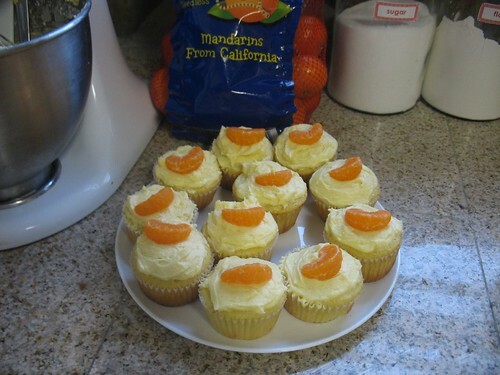 I just bought a box of Clementines, and I'm going to make those cupcakes tonight. I'm Sarah. I live in Portland, OR & I have a deep admiration for the domestic arts, so this is my place to share that love! new tattoos = home made cat & dog treats! freebie. free amazon gift certificates rule. $5 meals! african peanut stew! ooooh my darlin clementine..vegan cake! my love of mason jars continues...in pie form! easy vegan cheese sauce mix.